Welcome to Cutlines Glass, Bristol based experts in stained & etched glass design, repair & manufacture. Cutlines Glass is a Bristol based studio specialising in stained glass design and production, stained glass repair and etched glass design and production. With many years experience behind us we endeavour to give you friendly, honest advice and affordable solutions using quality materials and traditional techniques. We have worked on projects throughout Bristol and the surrounding areas, in the Midlands and also internationally. Cutlines Glass offer a range of specialist services and pride ourselves on delivering the highest quality of craftsmanship with a dedicated, personal touch. Be it with the subtlety of an etched glass piece or the vibrant colour of a stained glass panel, we will design and produce a bespoke commission tailored perfectly to your requirements. Taking the project from the initial design concept to a beautifully finished and fitted window, we will see you through every stage, or be on hand for expert advice when required. Cutlines Glass provide a full stained glass design and production service to create traditional and contemporary stained glass windows for both residential and commercial settings. 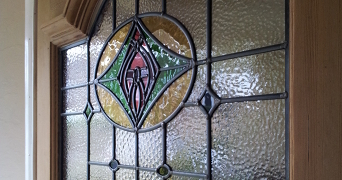 An excellent way to add character to your home whether your needs be decorative or functional, stained glass will provide you with a bright, beautiful solution. At Cutlines Glass we have many years experience in stained glass repair and restoration, from churches to Victorian period properties. 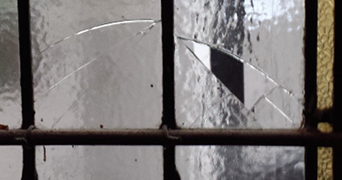 Restoring leaded windows helps to retain valuable historical features and can be a low-cost alternative to a brand new lead light. We endeavour to use authentic materials and traditional methods where ever possible. Etched glass is an incredibly versatile solution to many residential or commercial job requirements. Its semi opaque, frosted surface offers you privacy whilst gently diffusing light. 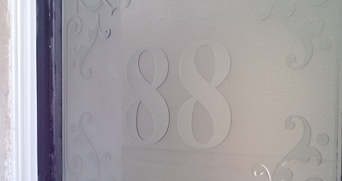 We can create a wide range of etched glass designs for you from etched glass house numbers to reproduction Victorian patterns no longer manufactured.